MAKE AHEAD: These tacos taste best if you eat them as soon as the plantains come out of the oven. The pumpkin seed crunch can be made a couple of hours ahead. These wholesome yet rich-tasting soft vegan tacos filled with chunky, savory refried beans and caramelized ripe plantains will please everybody at your table, including the most fanatic meat taco aficionados. My mom and I came up with the recipe the last time she visited us. We paired the refrieds with the plantains and topped them with a crunchy mix of toasted walnuts and pumpkin and sunflower seeds tossed with seared scallions. 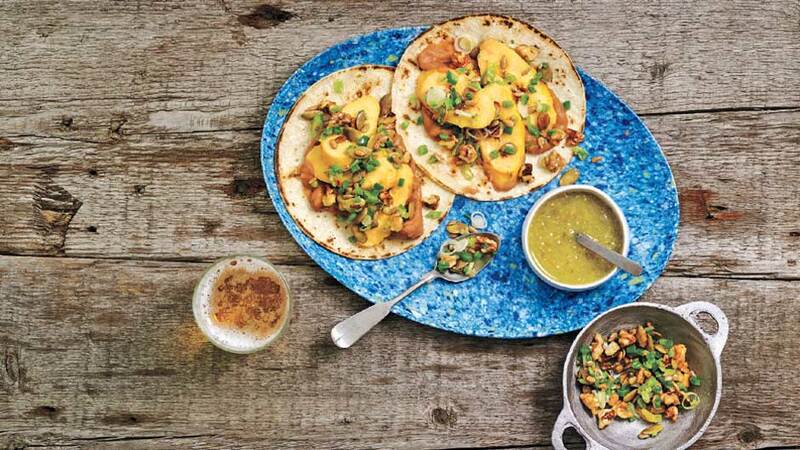 Don’t hesitate to drizzle a liberal amount of quick salsa verde over the tacos. Roll the unpeeled plantains on your counter for a few seconds to really soften them up. Line a small baking sheet with aluminum foil and place the plantains on it. Bake for 30 to 40 minutes, or until the plantains are completely cooked, have broken through their skin, and are lightly browned on the outside and caramelized. While the plantains bake, heat the oil in a large skillet over medium heat. Add the scallions and jalapeño and cook, stirring occasionally, until softened, 2 to 3 minutes. Add the salt and stir well. Make room in the center of the skillet and add the walnuts and pumpkin and sunflower seeds. Cook for 30 seconds, without stirring, then stir the seeds into the scallions and jalapeño and cook, stirring, for another 2 minutes. The walnuts and seeds should be lightly toasted. Remove from the heat. In a small skillet or saucepan, heat the refried beans over medium heat, stirring often. Remove from the heat. Cover to keep warm. Peel the plantains while they are still hot and slice or chop them. Spoon a couple of tablespoons of refried beans onto the center of each tortilla, add 3 or 4 slices or a couple of tablespoons of chopped plantain, and top with a couple of tablespoons of pumpkin seed walnut crunch. Drizzle salsa on top. Eat while hot! MAKE AHEAD: The salsa can be made up to 4 days ahead, covered, and refrigerated. Salsa verde is one of the basic items always found in a Mexican restaurant or home, because once you have it, you can’t live without it! It is used as the base for multiple dishes, such as Tamal Casserole with Chicken and Salsa Verde (page 183). Just spooning it over sunny-side-up eggs makes a perfect light meal of huevos con salsa verde. Good and easy to make, it’s a great garnish or topping for tacos, que­sadillas, and many antojitos. Combine the tomatillos, chiles, and garlic in a medium saucepan, cover generously with water, and bring to a simmer over medium heat. Cook for 10 to 12 minutes, until the tomatillos go from pale to olive green and are thoroughly tender but not falling apart. Drain. Transfer the tomatillos and garlic to a blender. Remove the stems of the chiles and set 1 chile aside. Add the other to the blender, along with the cilantro, onion, and salt, and puree until smooth. Taste for salt and adjust if desired. If you want more heat, add some or all of the remaining chile and blend together. Serve. Pati Jinich is the host of the popular PBS show Pati's Mexican Table going on its Fifth Season and resident chef of the Mexican Cultural Institute in Washington DC. Her new book is Mexican Today: New and rediscovered recipes for contemporary kitchens on-sale April 12, 2016. She appears regularly on NPR, The Splendid Table, NBC’s Today Show, ABC’s The Chew, and CBS's The Talk. She hosts live programs for the Smithsonian Institution and has cooked at the White House for President Obama’s Cinco de Mayo celebration. She was just nominated for two prestigious James Beard Awards and two Daytime Emmys. She lives in Chevy Chase, MD with her husband and three sons.